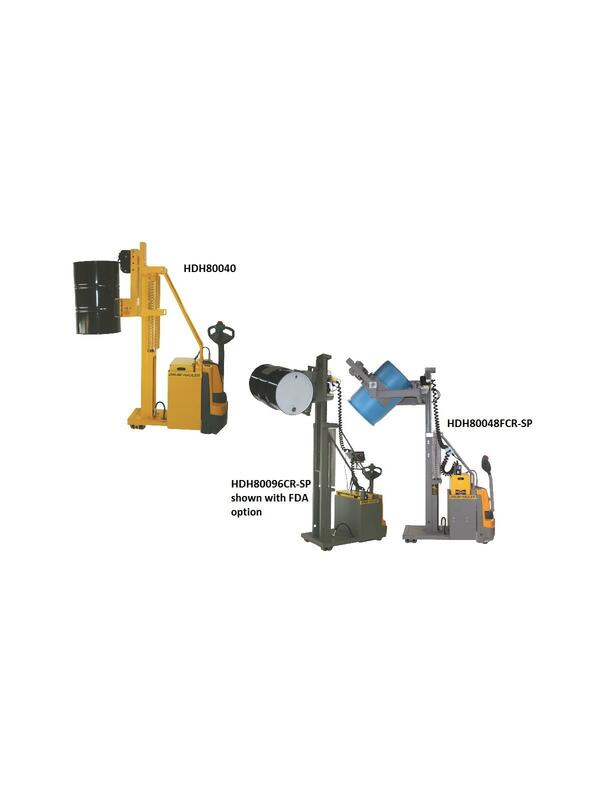 Self Powered Drum & Roll Transporters eliminate injuries from manhandling drums. Makes an easy task of transporting drums in and out of trucks, or up and down ramps or traveling over long distances. Standard Features Include: AC drive motor with regenerative braking, electronic speed controller, tandem load wheels, stability casters, Deka 12D-85-9 industrial 24-volt battery, safety reversing switch, key on/off, horn, battery discharge indicator/hour-meter, powder coat finish. FOB Shipping Point. -SP: FDA approved epoxy powder coating with stainless steel hardware. Battery Charger (30 amp / 24-volt output) 110 volt input. EE" Rating - Factory Mutual Approved. -S: Non-intrinsically Safe Scale with Model 8000XL Indicator. 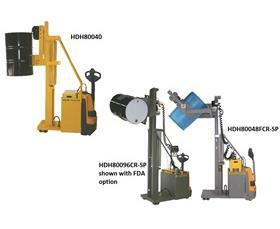 -IS: Intrinsically Safe Scale with Model 8000IS Indicator - for "EX" rated areas. -SS SIDE SHIFTER with 8" of travel: 4" left & 4" right of center (N/A on two-stage masts). Anti-Drift Motor Brake (Recommended for FCR Clamp when suspending load for long periods). Adjustable clamping pressure with gauge. Contact us for more information on options.